Chocolate Drops was one of the first businesses in Australia to be granted Chinese Accreditation along with Proprietor Sue Dash and Assistant Manager Shaye Fitzpatrick. 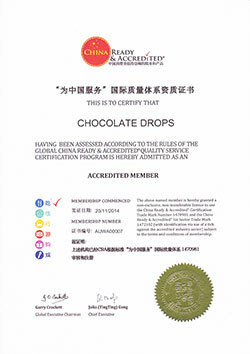 Accreditation recognises Chocolate Drops as a Chinese Visitor friendly business which is promoted domestically in China and allows the use of various logos recognised by Chinese Visitors. The menu has also been translated into Mandarin.